Excess parathyroid hormone happens when your parathyroid glands make too much hormone. It is also called primary hyperparathyroidism (hi-per-par-a-thy-roid-ism). 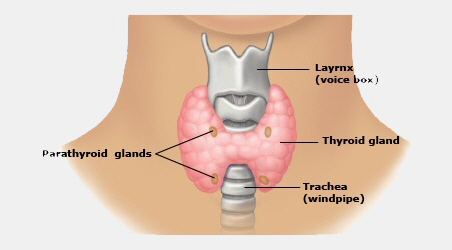 You have four parathyroid glands, which are in your neck, just behind your thyroid. They are each about the size of a grain of rice. The parathyroid hormone they make controls the amount of calcium and phosphate in your body. When you have too much parathyroid hormone, you get too much calcium in your blood (hypercalcaemia) and too little phosphate (hypophosphataemia). This is called hyperparathyroidism. Primary hyperparathyroidism is when it happens because of a problem in your parathyroid glands, not because of something else. The most common reason for this happening is that one of your parathyroid glands becomes enlarged and overactive. This is called an adenoma. It is not cancerous. Another reason is that some of the glands become overactive. This is called hyperplasia. It is not cancerous. It can also be caused by parathyroid cancer, but this is very rare. Excess parathyroid hormone affects women more than men, and it usually starts after menopause. It is very rare in younger people. How do I know if I have excess parathyroid hormone? A blood test picks up excess parathyroid hormone by showing the amount of hormone in your blood. It will also show you have high calcium levels and low phosphate levels. You may also need to have a bone density scan to check the thickness of your bones. If your doctor thinks you might have kidney stones, then you may also need a kidney scan. If your high calcium levels aren't treated they can cause confusion, vomiting, and heart problems. It can also cause unconsciousness, but this is rare. This condition can also cause kidney stones, stomach ulcers, thin bones, and an inflamed or swollen pancreas. How is excess parathyroid hormone treated? Your treatment will depend on how high your calcium levels are and how bad your symptoms are. If your calcium is just slightly higher than normal and you don't have any symptoms, your doctor might recommend that you have a blood test every six months to check if anything changes, but don't have any other treatment. If you do have symptoms, then you will need surgery to remove the overactive gland or glands. Surgery is usually straightforward, but you will need to stay in hospital for a couple of days. Occasionally surgery can damage your other parathyroid glands, and you can get low calcium levels. You will have regular blood tests after surgery to check this. You might also get a hoarse voice following surgery, which may be temporary or permanent. Very occasionally surgery will not work and your symptoms will return. How can I make sure I stay well? If you have primary hyperparathyroidism and are not being treated, or if surgery has not fully solved the problem, you can do several things to look after yourself. Avoid medicines such as water tablets (diuretics). Tell your doctor you have hyperparathyroidism before you start new medicines. Make sure you drink enough fluid. If you get dehydrated your calcium levels can get even higher and you can start to feel unwell. See a doctor to get a blood test if you have vomiting or diarrhoea.